In a wildly uncharacteristic move, Apple disclosed future product plans to a group of journalists in April. At the event, Apple marketing chief Phil Schiller and Senior Vice President of Software Engineering Craig Federighi dished on new Pro-branded hardware coming. 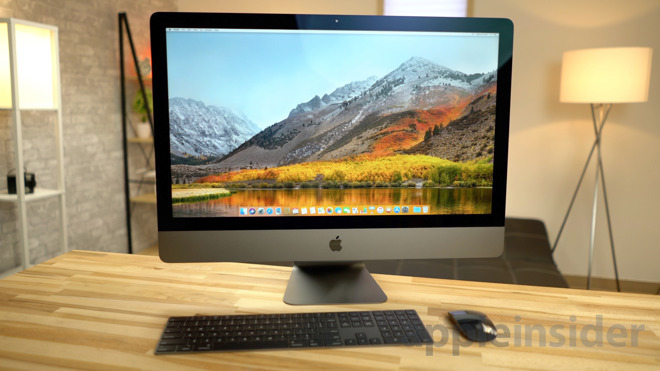 During the conversation, the pair of Apple executives teased the iMac Pro which would see the light of day a few months later at WWDC, a new Pro display of some sort, and a new "modular" Mac Pro. The iMac Pro was promised in 2017, and it made the deadline with about two weeks to spare. 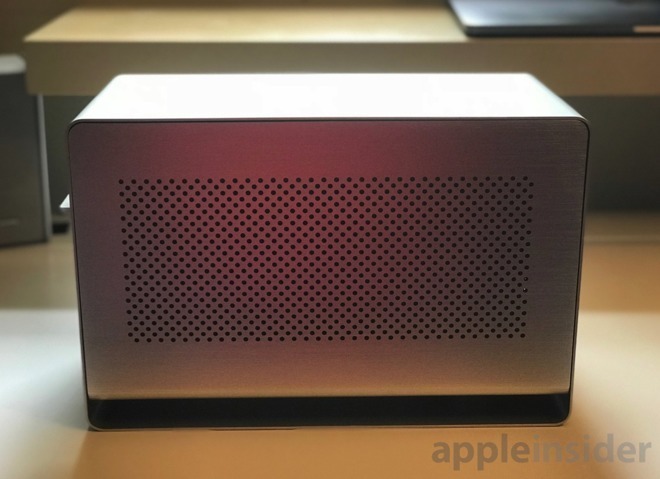 The Mac Pro was said to be "not this year" —more on that in a bit. 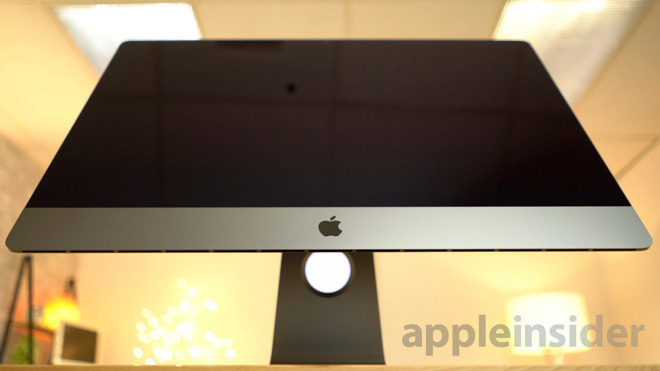 The WWDC saw a brief mention of the iMac Pro. It heralded a return to the Xeon processor family, after four years of product development without them. Also promised for the machine was up to 4TB of flash storage, up to 128GB of RAM, and up to 18 cores. Not much else was disclosed about the machine at the time, including price, or a specific shipping date, beyond before the end of the year. 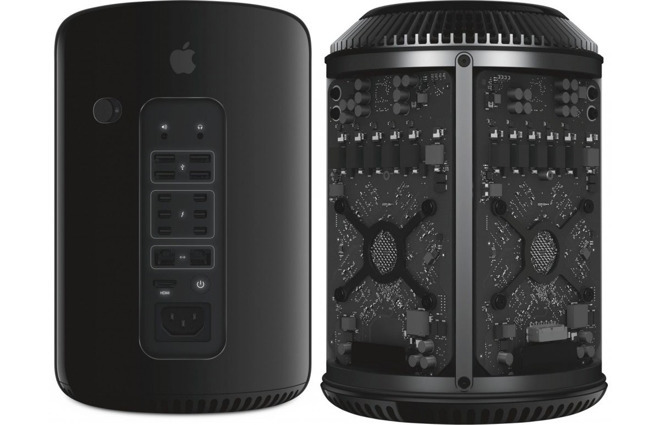 Preorders for the machine have started to arrive in customers' hands, amidst some complaint that the iMac Pro is still not "Pro" enough for a given use case. But that's the real issue —Apple has hemmed itself into a corner with the "Pro" nomenclature. The internet being what it is, fans and foes alike infer too much from the marketing term. Not every "Pro" user is alike or has the same use case. Apple can't possibly make them all happy, and, frankly, shouldn't be expected to. Should the iMac Pro, and the consequent "not this year" Mac Pro not sell well, the "Pro" shouldn't expect to see more of it. Like with "Pro" complaints about the 2016 MacBook Pro refresh, some users are lamenting Apple's choices. Some complain about the 5K screen, saying that they need something better. Others complain about a lack of expansion, and say that because they can't upgrade it easily, means the machine isn't "Pro." It would have been better if Apple just stuck with a range of MacBooks of escalating performance back in the day, and just skipped the "Pro" tag on the gear entirely. Not because they aren't for professionals —but because they are, and the people using them don't need to be reminded of such. And before you get on a "Steve Jobs would have considered all this, and not left us in the lurch" kick, remember that Jobs himself axed the Pro-grade Xserve, because nobody was buying it. And, only 19 months had elapsed between last hardware revision and the death of the product. Many user hopes are being put on the forthcoming Mac Pro, but there is no real focus of need from that user segment. So, Apple's got to choose what they want to do, lacking a clear consensus from the "Pro" segment who seem to like arguing about what the machines don't have that they need, more than they, or we, care to realize that there is no ultimate machine that will please everyone. Apple isn't sticking with the "Coke can" design for the new Mac Pro. Federighi said that they had painted themselves into a corner with the thermal design for the product. Additionally, the architecture that Apple designed was forward-thinking, and they missed the target. "We designed a system with the kind of GPUs that at the time we thought we needed, and that we thought we could well serve with a two GPU architecture," Federighi said in April. "That that was the thermal limit we needed, or the thermal capacity we needed. But workloads didn't materialize to fit that as broadly as we hoped." Presumably, Apple has that figured out for the future, in what Federighi called a "modular" Mac Pro redesign. But, at the time the pair of Apple executives never said anything about upgradeability, and still haven't confirmed the presence of PCI-E slots in the new machine at all. Schiller and Federighi were very specific about the iMac with "server-grade" components availability in 2017, and we got exactly that. Computers aren't designed in a vacuum, and it is pretty clear that given that there were prototypes at the WWDC announcement for attendees to try, that the hardware had been in development for some time. So the iMac Pro wasn't necessarily a knee-jerk response to anything. They were less specific about the Mac Pro both in April, and in the press release surrounding the iMac Pro. At the April event, the phrase "not this year" was said —meaning not 2017. No year again. "Modular" again —but at least this time it says upgradeable, so maybe unlike the iMac Pro, we'll get a RAM door. The first chassis leaks for the 2016 MacBook Pro refresh surfaced in the summer of 2016, with the machine shipping in October. 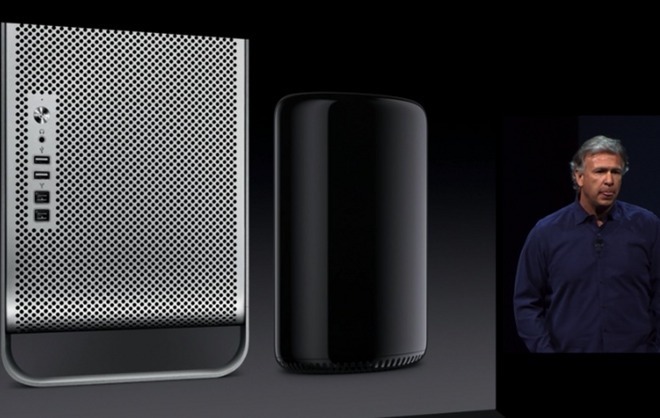 We've seen nothing at all from supply sources that could be a new Mac Pro. But, as a reminder regarding the vaunted "upgradeability" —Apple has never explicitly allowed CPU upgrades. Just because it's been possible with a very few 68030 and 68040 socketed chips, the slotted 601 PowerPC chip in some models, the G4 tower, and now common with Mac Pro tower users still clinging to the old machines, author included, doesn't mean that Apple has ever allowed it, much less encouraged it. In fact, with some G4 firmware revisions, they actively took steps to discourage it. Modular may very well mean "upgradeable with Thunderbolt 3" peripherals. In essence, Thunderbolt 3 provides PCI-E x4 bandwidth, used to good effect in external GPU enclosures. Apple is officially launching the feature in the "spring" with High Sierra —but again, there is no specific release date for it. PCI-E x4 is sufficient for most implementation. In fact, in our eGPU testing, it hasn't been much of a choke-point at all, versus a PCI-E 3.0 x16 expansion slot. Preliminary AppleInsider testing with a Vega 64 PCI-E card in our faithful Mantiz eGPU enclosure is delivering about 10 percent more performance than the down-clocked Vega 64 chipset standard to the 10-core iMac Pro, and is far faster than the Vega 56 in the $4999 configuration. Apple may decide that external expansion is sufficient, and easier for users to execute. Given that Intel is loosening up licensing restrictions and costs for the technology in 2018, maybe costs will go down on Thunderbolt 3 peripherals as well. Apple has made its first move towards the "Pro" market in 2017, more than it has in previous years. Maybe it was Apple deciding that like the Xserve, the market was stagnant, and maybe it didn't like what Intel was offering for chips. Who knows, and they don't talk about it much. Apple also claims that in its heyday, that "Pro" desktops were "low single digits" of sales. This may be a Chicken or the egg situation —which begat which, the poor sales, or the lack of new hardware? Again, Apple isn't talking. But, what they did talk about is the iMac Pro and future Mac Pro. As the vanguard of the effort, the iMac Pro is clearly a test balloon to see how much of a demand there is for Apple hardware in the segment. Should the iMac Pro, and the consequent "not this year" Mac Pro not sell well, the "Pro" shouldn't expect to see more of it.